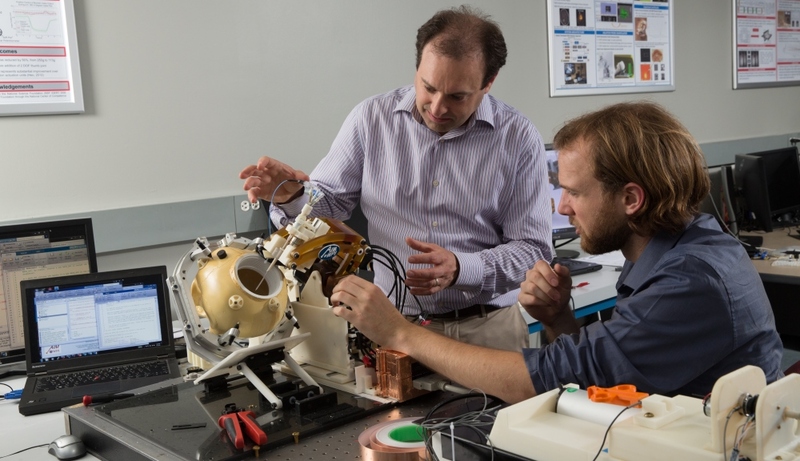 PracticePoint Director Greg Fischer (standing) and Research Scientist Chris Nycz work on medical robotics prototypes. PracticePoint is an agile, scalable collaborative research facility featuring point-of-practice clinical suites—including a residential suite, rehabilitative care suite, controlled care suite, and surgical imaging suite—co-located with engineering and manufacturing capabilities and test equipment, where devices and systems can be researched, developed, and tested. “We’re very excited to have Boston Scientific recognize the potential for PracticePoint to further its research and development program and more quickly develop, iterate, and perfect medical technologies that can have a truly meaningful impact on patients,” said Greg Fischer, PracticePoint director. Through PracticePoint, members—including public and private universities, research institutions, clinical partners, industry, and innovators—can collaborate on developing and incorporating cyber-physical systems (CPS) into medical devices and equipment. These new products and systems can improve performance, security, accuracy, timeliness, costs, and outcomes in human healthcare. PracticePoint members gain access to its facilities and to research support and WPI faculty expertise. Members also have an opportunity to work with student teams on long-term research projects. Through WPI’s distinctive project-based curriculum, student teams conduct a range of professional-level research and design projects with corporate sponsors. These specific, goal-focused projects—including Interactive Qualifying Projects and Major Qualifying Projects conducted in the third and fourth years of undergraduate study and required for graduation, along with master's capstone projects and PhD research—often produce significant advances for WPI’s partner organizations. PracticePoint fosters professional collaborations among its members and partner institutions through shared, coordinated use of state-of-the-art test beds, secured project pods, collaboration suites, and shared tool bays. The ongoing PracticePoint Collaborative Forums, held at WPI Seaport in Boston, bring together key stakeholders from industry, academia, healthcare, and user/patient groups to help identify, discuss, and address challenges in various healthcare technology fields. Housed at WPI’s Gateway Park campus, PracticePoint is an applied research and education center designed to accelerate development and translation of cyberphysical system (CPS)-enhanced technology and to develop the talent pool and accompanying ecosystem that can help Massachusetts companies attain market dominance in the state’s medical device industry cluster. PracticePoint was launched in 2017 with a $5 million matching grant from the Massachusetts Baker-Polito Administration and the Massachusetts Technology Collaborative (MTC). Founding partners are the MTC, GE Healthcare, University of Massachusetts Medical School, and WPI.